George Waller Lendrum was born on 5 August 1882 at Magheracross, Irvinestown, County Fermanagh, son on George Cosby Lendrum of Magheracross, JP DL, and his wife Antionette Frances Lendrum (nee Butler). Lendrum changed his name to Vesey in order to inherit a family property, Derrabard House, Fintona, County Tyrone. On 24 April 1915 he married Sybilla Sarah Bernard at Fretherne, Gloucester. The couple had one child, Barbara Waller Mary Vesey, born on 13 November 1917. Two weeks earlier Vesey had been commissioned as a 2nd lieutenant and posted to the North Irish Horse. He was promoted to lieutenant on 18 November. On 16 November 1915 he embarked for France as an officer of F Squadron. In June 1916 this squadron combined with C Squadron and the 6th (Inniskilling) Dragoons Service Squadron to form the 2nd North Irish Horse Regiment. 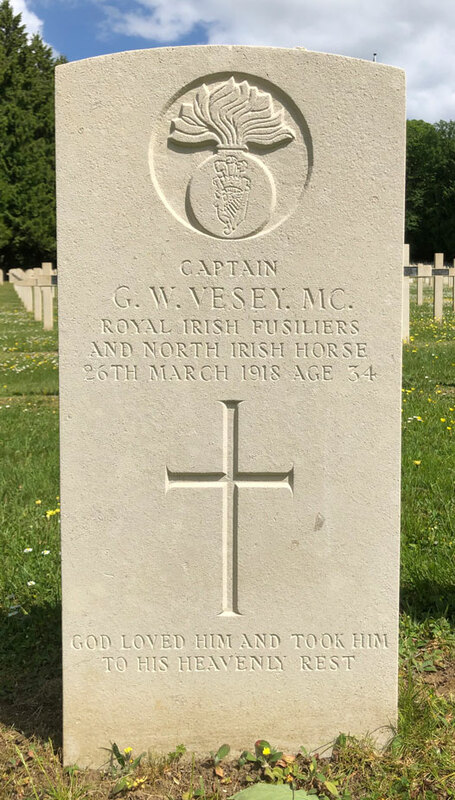 In September 1917 the 2nd North Irish Horse Regiment was dismounted and most of its officers and men absorbed into the 9th (Service) Battalion, Royal Irish Fusiliers – subsequently known as the 9th (North Irish Horse) Battalion, Royal Irish Fusiliers. 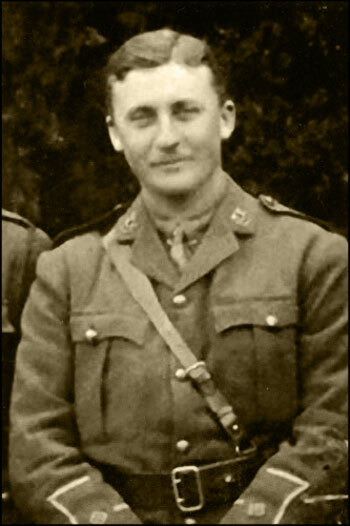 Vesey reported for duty with the battalion on 17 October and was posted to A Company. On 6 December he was promoted to captain. For conspicuous gallantry and devotion to duty. He led a patrol and rushed and captured an enemy machine gun which was in action in a trench running out from our lines and killed several of the crew. He then established a block in the trench and so improved the position. His initiative and resource were a splendid example to his men. On 21 March 1918 the battalion was in the St Quentin sector when the German spring offensive began. Two days later after heavy fighting they fell back on Berlancourt and Guiscard, the enemy continuing to press the attack through the evening and heavily shelling the villages. That evening they came under the command of the French 62nd Division, and covered the withdrawal of their own division, the 36th Ulsters. During the night a number of casualties were sustained, including Captain Vesey, who was severely wounded. He was left in the care of the French when the battalion withdrew from Guiscard the following day. Soon after, they brought him to one of their field hospitals, Ambulance 4/51, at Ressons-sur-Matz, west of Noyon. He died there on 26 March. He was buried at the Ressons-sur-Matz French Military Cemetery. 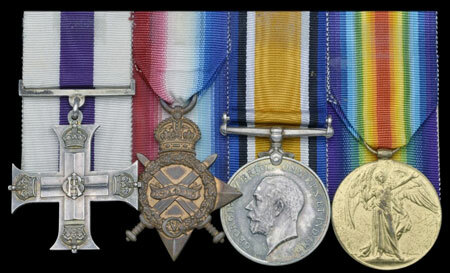 One of Vesey's brothers, Captain Marcus Beresford Lendrum, also served in the 9th Battalion, Royal Irish Fusiliers. Another brother, Captain Alan Cane Lendrum, served in the 2nd Battalion, Royal Inniskilling Fusiliers, and was killed in an IRA ambush near Doonbeg, West Clare, on 22 September 1920. Gravestone image kindly provided by Steve Rogers, Project Co-ordinator of the The War Graves Photographic Project, www.twgpp.org.